serious trolling chores with the tips outlines in this blog. I’ve made a career out of using and recommending line counter reels for trolling. No matter how you slice it, using a line counter reel is the most efficient way to monitor trolling leads and also to duplicate productive fishing patterns. The problem with line counter reels is they are expensive, especially for the novice angler who fishes only a few times a year. It’s true that a line counter reel is the best option, it’s not the only option to consider. An ordinary level-wind or baitcasting reel can be used for lots of trolling applications effectively. Depending on the trolling chore at hand, a baitcasting reel may or may not have adequate line capacity. For example, a typical bass style baitcasting reel has a line capacity of about 120 yards of 10-12 pound test monofilament line. A reel like this loaded with 20 pound test monofilament is not going to have the line capacity needed for say downrigger fishing. by the author make for functional trolling reels. 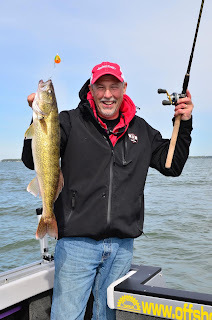 The good news is that a typical bass fishing baitcasting reel is more than adequate for light duty trolling applications such as walleye trolling with planer boards, bottom bouncers, etc. Round frame baitcasting reels generally have more line capacity and these can be used effectively for fishing lead core lines, downrigger trolling, trolling with divers and many other trolling chores. Line counter reels use a mechanical counter to indicate how much line is being played off the reel. There is a simple and surprisingly accurate way to meter the amount of line played off a baitcasting reel. By simply counting the number of times the line guide goes back and forth across the spool as line is played off, an angler can get a very good reference for trolling lead. This process is commonly called counting passes or counting bars. Let’s say you let out 10 passes of line and catch a fish with that lead length. It’s a simple process to duplicate that lead by once again playing out 10 passes of line. Counting passes is a pretty accurate means of metering trolling leads. Another option is to create metered fishing line by using a permanent marker to place hash tags on the fishing line at measured intervals. Using a tape measure, a Sharpie and a little time, it’s easy to mark the fishing line every 10 feet so measuring trolling lead becomes as simple as counting the color bands as they pass off the reel. 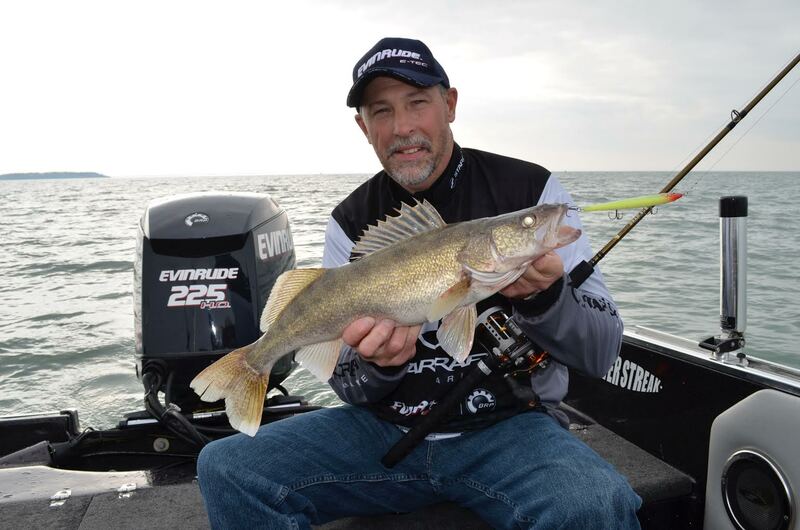 Professional anglers like the author widely recommend line counter reels. Fortunately there are other less expensive options for anglers to consider. A permanent marker will adequately color monofilament or braided lines for a considerable time before a new treatment is required. It’s a little inconvenient to use a Sharpie to mark your fishing line, but considerable savings at the pocketbook can be achieved. A third method trollers can monitor their trolling leads is by using an ordinary office rubber band to mark the line. When trolling let out a desired amount of line by counting passes or using metered fishing line. Then take a rubber band and half hitch it over the fishing line. If this particular trolling lead is productive simply reel in the rubber band when fighting the fish. 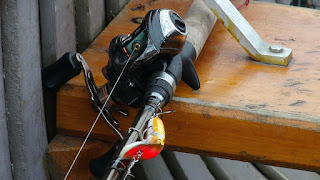 After the fish is landed, let out line again until the rubber band comes off the reel, indicating the precise lead length has been achieved again. This method makes it unnecessary to count passes every single time a fish is hooked, landed and the line reset. Line counter reels make monitoring trolling leads easier, but there is more than one way to skin a cat. Using the tips above any level-wind style or baitcasting reel can be converted into a functional trolling reel.